I’m back home after a week of mingling with delegates from 90 nations at the 6th Baku Humanitarian Conference in Azerbaijan. Being the naturally curious fellow that I am and long-time amateur expert on ethnicity and countries, I asked everyone I met where they were from. They were from everywhere. In return, they all asked me where I was from. I didn’t answer the U.S.A. or U.S. or America once; I answered them all with California. The 100 percent reaction: (Sigh) Ah–Cali—FOR—nia. And from many, another sigh when I said San Diego. World travelers, people of the world, diplomats and academics, they all know San Diego. The savvy ones know the University of California San Diego, with 38,000 students and ranked the 5th best public university in the United States. Many of those people also know San Diego State University. With its 32,000 students, it’s the highest nationally ranked California State University campus. The people at the conference knew universities around the world. Many attended universities outside their countries including the University of California and San Diego State. For example, a few years ago, a national Azerbaijani dance company was booked into SDSU for an evening national dance and musical show. It performed to a standing-room-only audience. When booked into the Civic Theater, 3,000 people sold out the show. None of these people of the world mentioned to me any San Diego shopping malls or entertainment centers. Most laughed at the idea of “Major League Soccer” playing in a toy stadium holding 22,000 people. All of us had passed an 80,000-seat stadium on the way to the conference center. When a touring European soccer club comes to town, the stadium fills up with people who enjoy real, major league soccer, not tertiary quality soccer that can’t defeat a good American university soccer team. 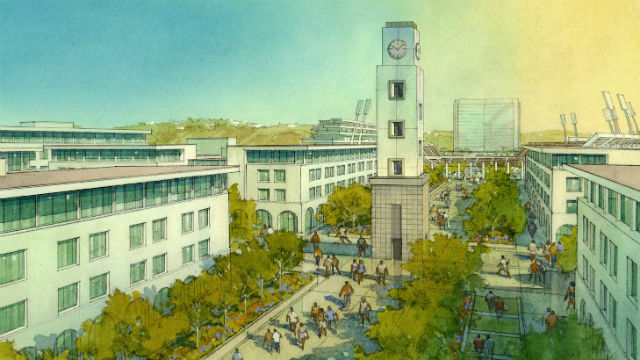 Most of my new acquaintances were taken with the idea that San Diegans had the opportunity to vote for — in essence — an expansion of the 32,000 student SDSU campus. They pointed out that no local citizens in their countries — no matter the country — would ever have the opportunity to choose whether or not or where an important university can be sited or expanded. These people of the world, almost unanimously well-educated, all realize the benefit of a university education. Educated people are smart people. When I described Measure G, which will authorize the city to negotiate a sale to SDSU of an empty parking lot so it can build a decent stadium, new classrooms, dormitories, condominiums and apartments for students and faculty, and research facilities, while the opposition wants a puny minor-league stadium and bars and condos, to the man and woman they laughed. When I described how those opponents are publicly smearing SDSU supporters, they rolled their eyes and laughed. What does that have to do with a university expansion on a vacant parking lot? Every one of those fine educated people I met in Baku last week told me they wished they could vote for Measure G on Tuesday. I told them surveys say it looks like a winner. Educated people and people who want a better education for their children are for Measure G.